HomeIf you like iced coffee, try it Louisiana style. If you like iced coffee, try it Louisiana style. I was never much of an iced coffee drinker before I visited Louisiana with my wife. She introduced me to Community Coffee, or CC’s, as they call the coffee shops down there. I’d compare them to Starbuck’s, but CC’s actually makes a good cup of coffee. They’ve been around since 1919 and import green coffee beans from Brazil to roast locally. My favorite blend is their Between Roast, which is darker than medium but not a full dark roast. Their French or Dark roast works best for iced coffee. When they make it, it has a rich coffee flavor that holds up to the ice needed to keep you cool down there. I searched on how to make my own, and while ordering coffee from the Community website, I saw the Toddy cold brew system. Apparently I was not the only customer who wanted to make their own! You need 9 cups of water and a pound of coffee to make a jar of concentrate. Good thing CC coffee is still a full pound! This steeps overnight in the cold brewer, then filters into the jar. Then you mix 1/3rd coffee concentrate, 1/3rd water, and 1/3rd milk to make the smoothest iced coffee you can imagine, with a strong coffee flavor. Use half and half to make it creamier. You can also heat the concentrate for hot coffee. The cold brewing removes the acids and will keep you from getting heartburn if coffee upsets your stomach. Of course, CC coffee tastes great made in a percolator or drip machine, and they also sell K cups and pods. In the winter we switch to hot coffee and make in a Bunn brewer that serves it piping hot. I prefer the Between Roast hot, and the Dark for iced. Community Coffee also has a Military Match program. If you order four pounds of coffee for a friend or loved one on a base, they will match the order. The Cold brew system costs around $35 and we’ve used ours for years. 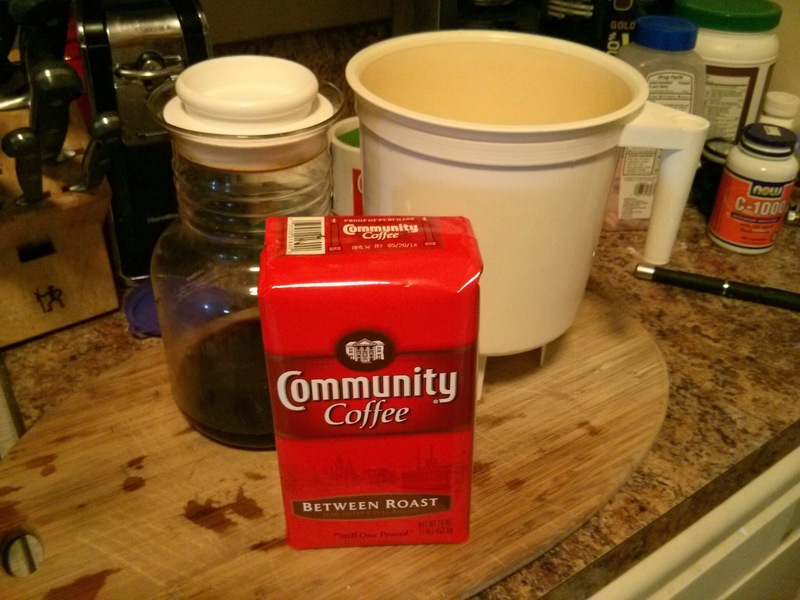 It will of course work with any brand of coffee you like, but I urge you to try CC’s. They ship, and have a coffee club where they discount a regular shipment for you. I just go to the CC’s on Decatur. No beignets, though! Community Coffee have their own places now? That’s new since I left. Lots of changes, it seems! I see even Deannie’s has a place in the Quarters now. Even though I worked in the CBD, I tried to avoid the Quarters as much as I could! Too many tourists and too many “pretend” bars and clubs. I stick to Fat City and other places off the path where the food is real and the music is, too! The movie THE BIG EASY showed the places to avoid! Tippitina’s as a place to eat? Okay… Only if you’re from Iowa… Or, Court of Two Sisters? Like to see someone find a native eating there… Okay. Rant over. I just see in my home town what I think you see in your area–the “pretenders” for good food! Why have you never made this for me? I know I have been around for at least 3 years. Hmm. You drank it at the pool last time!